Formed from 1933 to 1941, During the Construction of the Grand Coulee Dam, from the backwaters of the Mighty Columbia River. Stretching over 152 Miles up the Columbia River Channel, From the Grand Coulee Dam to the Washington / Canadian Border, Lake Roosevelt is the Largest Man Made Body of Water in the State of Washington. is Stocked with Kokanee ( Land locked Salmon, ) Walleye, Silvers, Rainbow Trout, Lake Whitefish, White Sturgeon, & even Yellow Perch. Lake Roosevelt's Full Pool is 1290 feet above sea level. Spring Canyon & Crescent Bay Charge $5 to put in. Looking East from the Grand Coulee Dam End of Lake Roosevelt at Dusk. 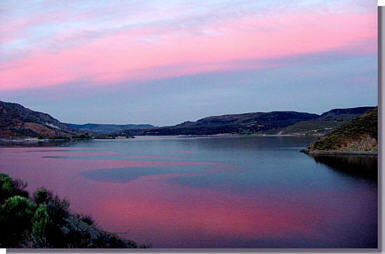 There are 5 boat ramps on Lake Roosevelt in the Grand Coulee Dam Area of Lake Roosevelt. Gifford Ferry off Hwy 25 to Inchelium.